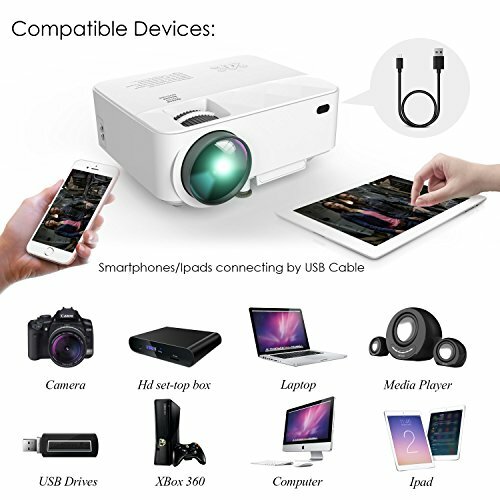 Do you want your projector and smartphones or iPad achieve the same screen display? Look no further. Thanks to DBPOWER’s advanced technology, the T21 offers a top home cinema experience for a very reasonable price. 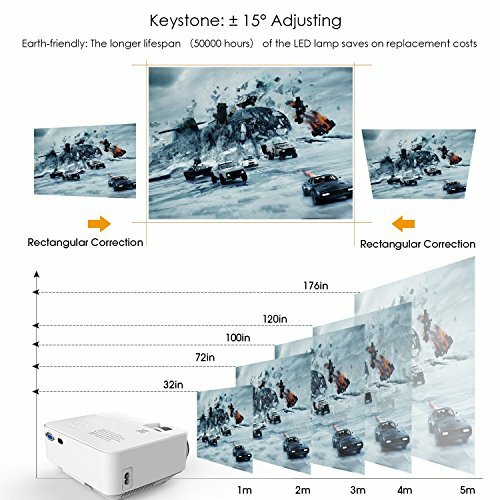 High-fidelity images, superior quality and convenience of use, along with a wide application scope, makes the T21 one of the best projectors in its class. 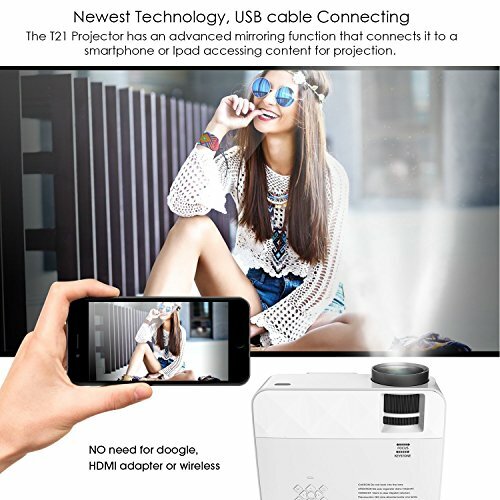 1.Why choose the DBPOWER T21 portable mini projector? Convenience of use – by simply using a USB cable, you can project your smartphone and iPad’s screen. Compared to wireless projectors, the T21 uses less energy, making it better for the environment and your pocket! Its operation is also smoother and dongles or HDMI adapters are not needed anymore! 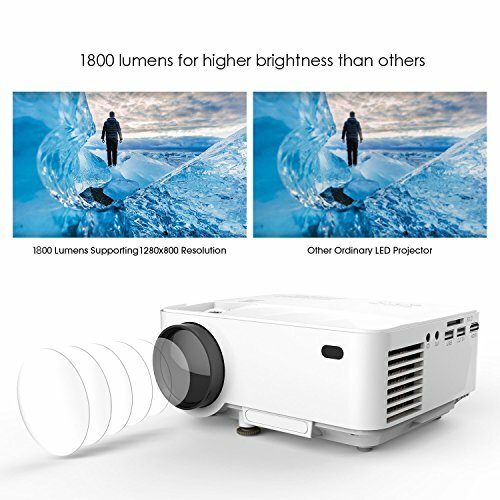 Upgraded LED light technology – Brighter than other projectors Improved fan and system sound – The fan noise is lower than other similar LED projectors Large Screen – Take the strain off your eyes that TV screens give you. Relax your eyes from the TV keystone effect. 2) Please turn on hotspot and Airplay when connecting with iPhones. 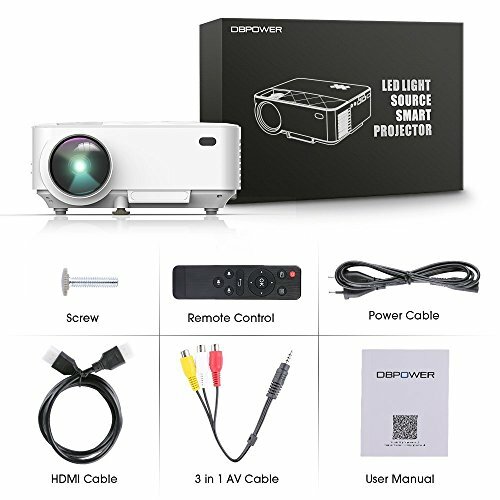 3) To connect the mini video projector with PCs and laptops, please adjust the PC/laptop’s display resolution to 800*600 or 1024*768 for best clarity. 4) Dolby is not supported. If there’s no sound, please turn off Dolby Digital in AppleTV, Blu-Ray players and Firestick etc. 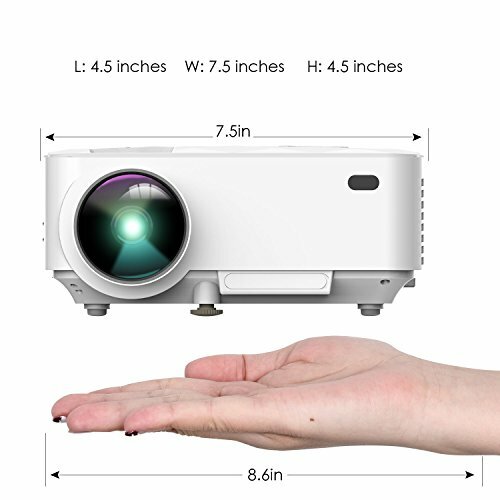 1 x user manual.BRIGHTER THAN ORDINARY LED PROJECTORS: 1800 Lumens LCD mini projector is ideal for home entertainment in the dark, brighter than other LED projectors. NOT RECOMMEND for PPT or business presentation. AMAZING WATCHING EXPERIENCE: With projector distance 1.5m-5m, image size ranges from 32” to 176”. 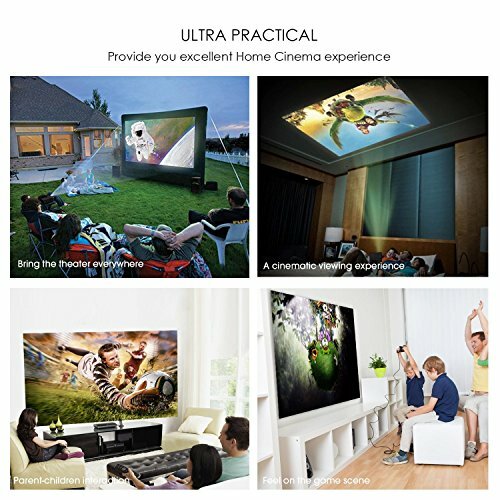 For the best watching experience, 2-2.5m projector distance with the image size of 130” is suggested.